However, how wonderful to look out from under my turtle shell and see the amazing things going on. And I think much of this we owe to the photographers who have captured the well horse. I think these images have done so much to soothe and lead the human. photo by John Wheland, rock star in my eyes! Our wellness and their wellness are intimately linked. I have a wish. These same photographers who capture the well horse. Can they capture the well human? My wish today is for Blue Zone Photography of Humans. The photographic capture of the well human. When people know how to be well, themselves, their ability to create a well horse grows exponentially. What we have seen is this: a concept like classical dressage turned into micromanagement, control, money. A concept like natural horsemanship turned into micromanagement, control, money. A concept like natural hoof care turned into micromanagement, control, money. A concept like equine veterinary care turned into micromanagement, control, money. Human concepts: the law, health care, medicine, education ... micromanagement, control, money. Production. We consider these horse photos as art, but to a scientist, they are are both data and art. They are production. I sense convergence. Wellness. The intersection of the principals of classical dressage, which are really just the conscious art of horse-rider, an understanding of optimal feral habitat leading to optimal domesticated habitat, yoga, spirituality, natural horsemanship, medicine, science, love, laughter, etc. etc. The beautiful photography and written word of Horses for LIFE and their highlighting of the artist Tony Stromberg have me incredibly hopeful. An excerpt photo showing all kinds of things that I try to point out from common hoof care practices via my case studies analyses. Here, though, let's just focus on the diagonal trotting legs in motion. They are uncoordinated in angle of incidence (don't line up) which is classic base wide energetics, broken back, rotated pelvis, effectively heavy front end etc. etc. Ironically, hyperflexion or rollkur bring the topic up to bear with some really nice photography, but all things horse, especially hoof care and on-the-ground handling, also affect your horse's collection. A somewhat easy way to identify a corrupted body form is by following the diagonals at the trot. Close angles of incidence, ie angles in motion at the trot between diaganols, means relative collection. Although hyperflexion destorys collection at every level, destruction of collection can also be driven by a myriad of other things, including common hoof care practices and on-the-ground handling practices, as well as excessive confinement and other species-inappropriate common care practices. The following are two photos from my home page slider (the horse is at the walk and not the trot). All gaits engage diagonal weight bearing, including the 4-beat walk. Here, we have profiled angles of incidence on same-side limbs at the walk. Can you see the difference in quality before and after the trim? I can. And so can he. Can you appreciated how collected this horse is? Remember, collection or the lack thereof, is not about positional information of footfall, face, poll, head, rather it is about coordinated and effective centralized weight bearing. The ability to bounce! LOOK! We need to start seeing the combined principals! The study of classical dressage, natural collection and the LINT/L - OFM (least invasive natural trim/lifestyle based on optimal feral modeling) share a huge intersection of content. The same gifts the ride on the left is giving the equine my trimming gives to the horses under my care 24 hours a day.......hints 1) look at the effective weight on the standing legs, 2) look how the head, neck, shoulder and front limb all appear to be one well designed piece on the left instead of parts stuck together, 3) look at how the belly or trunk is blocking upward motion of the legs on the right while upward motion of the legs on the left is part of a whole body lifting. Classical and natural collection have a huge content intersection. Landing versus lifting...which would you rather have for your horse? Regardless of our differences and the details in what we think constitutes "our horsemanship," it is this shared content, this truly seeing of the horse, that is ultimately going to allow all horses and all disciplines to improve, and as a result, all of humanity. I wish to goodness gracious I could perform the hoof care for some of these classical athletes.....The synergy of my optimization of the potential "strain" energy of the equine combined with the native intelligence of barefoot combined with improvements in habitat combined with true classical dressage, or really, all excellent horsemanship, regardless of what you like to call your particular discipline. "Where should I start looking for ideas and community for me and my horse?" Well, let me tell you!!!!! A great place to start is The Horse's Hoof, magazine and Facebook page. The barefoot movement is really just symbolic of mankind's pursuit of joy, excellence, spirituality, meaning, fun, value........ all that good stuff that causes our brief time here on the planet to be worth something, for us and those that we care about and, really, all the connected world. Because the movement is hoof centric, sometimes we forget it is also horsemanship centric, human centric, world centric and universe centric. So, the best place to really go to start any search for joy with your horse, which is really how we know we are on the right track in our lives, is someplace like the Facebook page of The Horse's Hoof. From here you can go zinging around the virtual world connecting with all sorts of wonderful and positive things. It also fufills the practical goal of getting in touch with what is happening in the United States and Beyond with the barefoot movement and all of the people and organizations that comprise that movement. "Holding the head" of lameness. Imagine you are a marathon runner. You need every piece of yourself during your run. You need to be as relaxed as humanly possible to breathe and enable yourself to properly use targeted muscle contraction to accomplish the task in front of you. Athletes enjoying their natural collection. Now imagine if you had a rope attached to a halter attached to your head attached to a human. You don't have a chance in heck of remaining sound if you are handled the way we handle most equines. In fact, the irony of many pictures taken of horses during lameness evaluations is that the photo shows the very handling that contributes to the horse's lameness. People seem to have no idea what harm they are doing by removing the slack in the rope or rein attached to a part of the body, especially the head, while the horse is attempting an athletic endeavor, even one as simple as a walk. If someone were to pull your head down or forward, you would have to exert force up or back to balance the pull. Once that happens, you are guaranteed to negatively affect the soundness potential of your equine. Why don't we pull on various parts of our human athletes with ropes or reins while they try to perform? Ridiculousness aside, it's because there is no athletic advantage, only harm, that could result. The absolute requirement for natural collection in athletic endeavors with humans is so sacrosant a principal, it is so common sense, that it is not even a part of our collective consciousness. But we willfully go about yanking, pushing, pulling and controlling horses during movement and then tsk tsk tsking when they come up lame. We then go on to blame all sorts of body parts of the horse's for the source of the lameness, instead of wonder what role we are playing in the event, either in handling, habitat, unnatural use, unnatural diet etc. We need to consider the quality we can bring to the physical interaction between us to make sure two things are accomplished 1) effective species-species communication and 2) unfettered, naturally collected movement (for both of us). To get used to the look of horses who are naturally collected, or improving their bodies on the collection "spectrum," please see my presentation on natural collection and the wild horse gallery. Want to learn how to develop the natural collection of your animal through excellence in handling? Look to www.lesliedesmond.com and www.theartofriding.com for starters. And please tell me who you might be working with that has allowed your horse to preserve or regain his natural collection through your work. There are many individuals out there that do this with their own horse or with client horses, but most don't realize that their ability to preserve natural collection is, in fact, what makes them good with their horse. And even fewer seem to know how to teach this goal. Let's change that and put all training programs under the umbrella of the first goal of preservation of natural collection. Mission: To build the vitality of the domesticated equine. Goals: Our research goals are to establish baseline data of what is possible in domestication if we maximize the expression of the native design potential of the horse. These goals will be met through the establishment of "blue zone" (vitality) principals in small acreage, guided by both human and equine on-going research, combined with LINT/L- OFM (Least Invasive Natural Trim/Lifestyle based on Optimal Feral Modeling) and LIMT (Least Invasive Medical Treatment) practices for both homeostasis (birth to death) and acute medical situations, as appropriate. These goals will help us to determine whether popular practices, medical or otherwise, help, hinder, or have no effect on the domesticated equine. These goals will be appropriate for: the equine pet, athlete and patient. These goals will have the secondary effect of advancing our understanding of the biology of the horse and its integration with emergent medical principals and practices (human and equine) and aid in the likely creation of new technologies and medicines for both diagnosis and treatment of conditions that afflict equines, and potentially other, species. 1) Show what the LINT/L- OFM looks like at the hoof, body and habitat level through intensive imaging (photograpy, X-Rays, film) of equines in various habitat, use and medical scenarios. All mapped variables with be correlated with vitality outcome. Owner and facility inclusion. 2) Use of intensive imaging to understand the difference between basic proprioception of functioning biological systems and conventional thoughts on "lameness and pain" with the goal of optimizing physical function. This includes the use of extant and developing hoof boots, and unfixed orthotic inserts, to assess performance in athletic endeavors. Owner and facility inclusion. 1) Sophisticated analysis of gait in response to the LINT/L-OFM both in athletic endeavors and "at ease" with the hopes of developing neuromuscular standards/techniques for training and recovery from injury. 2) Recovery rate analysis with LINT/L-OFM and LIMT in response to laminitis and founder. Correlation of outcome with endocrine markers. 3) Establishment of alternative athletic equine industries with these goals: 1) using exclusively adults in competition, 2) using equines that are physically raised and trained in correspondence with the LINT/L-OFM and LIMT principals and 3) using animals whose trainer's and rider's goals are to, first and foremost, both preserve and release natural collection in athletic endeavors. I have a lot of case studies, Gen....what to do with them all? For me, I'd like to just move forward and generate the next level of data, the type of data I am trained and ready to make. The next steps need more than just me, though. The next steps need help from the global community of researchers and horse lovers alike. Funding, structure, organization and performance. Before, your best shot! Left side. Handsome no matter what, even for an older gentleman such as yourself. Before (same day), your right side, an average shot. It was cold that day, almost every picture was blurry. Before (same day) Your hoof wants to grow a better breakover.....see that divergence at the coronary band and the position of your heel relative to the leg column? This is causing effective subluxation of your fetlock joint and destruction of your elastic potential energy carrying capacity by misalignment of all your soft stuff :), ie ligaments, tendons, muscle. Plus, landing your body weight on the planet via a metal rim, well, let's just say there may be, just may be, a better option than that Babe. After, average shot. 6 months of back breaking work in and while we may not win a centerfold shot in GQ, we damn well have some good stuff going on! Heels: well on their way to being where they will benefit you the most! Pelvis: less rotated! Neck, shoulder,limb juxtaposition: gorgeous! Subluxation of the fetlock joint: hah! Ewe neck: what what what! Saggy belly: it's outta there! Lifted back: you bet! Poker straight hind end stuck to a trunk: nope! Hoof balanced to the real information it is designed to respond to, ie skeleton, body use and environment: check! Bungee system in place: check! check! check!...Now go bug the ladies and I'll see you in 5 weeks! I may sometimes complain about how hard and dangerous the work is, how under funded and under appreciated, and how I, and all good natural trimmers, carry the weight of the world's mediocrity on our shoulders, but the truth of the matter is, I am lucky. I am so, so lucky to be able to give out true love. I have truly helped you, or should I say the greater design of life has truly helped you, every second of your day and that is a gift, the gift of truly giving to another being, that is priceless to the giver. I am the lucky one Gen. And I love you, dude. In the real way. See more on what we are looking at and talking about here in my presentation Natural Collection. Creating dysmorphism as a medical practice? This concept becomes more outdated every second of time that passes. I know of no other species but the equine where creating dysmorphism is still so firmly under the umbrella of "best practices." Hooves regenerate (at least hoof capsules do) and hooves heal. Right now it is my hypothesis that during laminitis and founder, most horses are healing despite us and not because of us. Why would I think that and how can we improve the situation? 1) We refuse to collect data on the subject (this REQUIRES baselines and controls, not conversation between people who do the same things), thus creating an "anything (that sounds impressive) goes" medical free for all, which we know, from every level 1 evidentiary analysis ever generated, does not create quality working medicine. We can do better. 2) Creation of dysmorphism, or mutilation, has been tried in human medicine. Thankfully, good research, and large scale data analyses, are regularly performed with the human species, so we have been able to phase out such approaches for ones that are more successful. Why would you believe the horses' tendons, ligaments, bones, dermis and epidermis work differently from all other species? 3) If you study my Natural Collection Presentation, what you see are horses heading from a dysmorphic state back to a more natural, or optimal, state under my care. The very trimming practices and fixed orthotics that much of veterinary medicine and many farriers use (as well as many "natural hoof trimmers") are generally what is creating that dysmorphic state to begin with. How can unnatural form, and the pain that results from it, help heal? 4) The majority of laminitis cases may arise from endocrine imbalance driven by lifestyle (much as type II diabetes and heart disease is driven by lifestyle in developed countries) choices. By chasing the red-herring of tinkering with unnatural form and cutting the capsule, we miss the whole point of setting the hoof up, as a complete biomechanical organ, to heal. 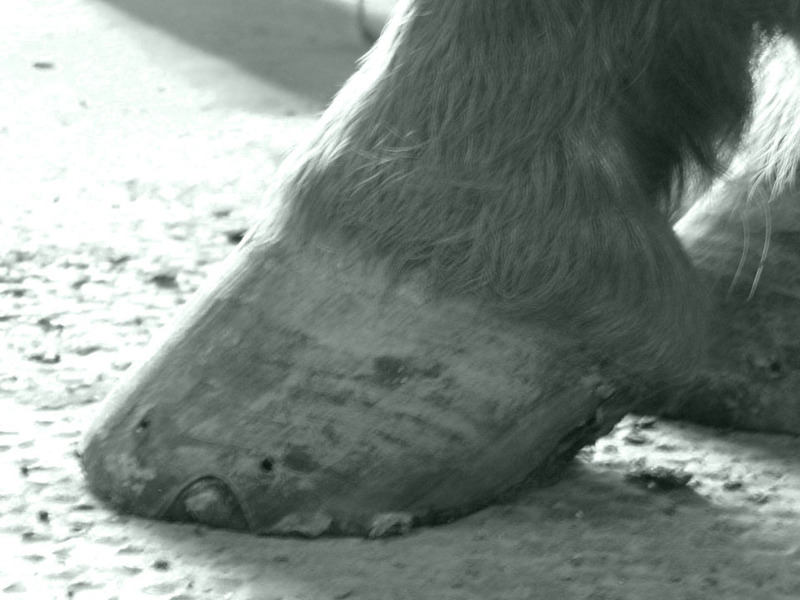 Healing takes time and patience, as the hoof grows more at a glacial speed than a texting speed. We are constantly misunderstanding the effects of time, and the natural flux of symptoms in a complex healing system, with our own tinkering. Thus, again, our focus is ineffective. Let's look at some information that should stimulate us to produce more data of better quality so that any assertions I might make can either be further supported or proven wrong. The following X-Rays are not related to me or any horse under my care. Rather, these are an example of a vet/farrier (V/F) case study: V/F X-Ray case study "before" (laminitic horse not doing well) and "after" (laminitic horse doing better). Some guy, at some point in time, asserted that the DDFT (deep digital flexor tendon) pulls the coffin bone away from the anterior hoof wall during laminitic episodes and thus "rotates" the coffin bone away from the anterior hoof wall. Some guy at some point said long toes create a lever force. What did that produce? Over trimmed toes and jacked heels, both in a horse's regular life and during medical crises .... an entirely dysmorphic, unnatural physical state with no known biological or boimechanical value (remember that biomechanical utility needs to be measured over time in relation to the whole organism and his state of overall biomechanical well being). Just because a percentage of horses get better with overtrimmed toes and jacked heels does not mean that those approaches helped; a percentage of horses will also have gotten better when painted blue. But I, for one, am not interested in blue paint. I am interested in true wellness. First, a hoof capsule that is cut open. For simplicities sake we will call the live red tissue "dermis" and the protein "armor" (here off-white) surrounding the dermis "epidermis." Now, the following Before (no shoe) and After (shod) X-RAy.....I have layered over the X-Rays a fixed line of dots extending from the dermis through the epidermis on its way to the anterior hoof wall. De-rotation is the claim???? Huh? In actuality, we haven't changed the relationship between the dermis and epidermis at all, which is supposedly the relationship that changes when many V/F combos use of the words "rotation" and "derotation"......look at the red and blue dots, for example.....nothing much has rotated or de-rotated here! How about between red and yellow? Red and green? (If anything, because the capsular protein grows down and out, we will have a slight rotation, by conventional measurement, naturally built in between the dermis and epidermis, or dots, as the hoof grows). They V/F combo has, though, in this instance, as is general practice, manipulated the outer shape of the epidermis to make it look as if we have done some "de-rotation." (More detail available on this in my Modern Medicine Presentation and why making things that aren't perfect look perfect destroys their ability to heal). Ironically, trimming the capsule this way causes the hoof capsule to rotate away from the leg column and destroys skeletal alignment and the elastic energy potential of the limb. See my case studies in the Natural Collection Presentation for example after example of my reversal of this. In the Natural Collection Presentation, we see limb alignment and energetic body integrity, or lack thereof, from whole body photography. Here we see these things at the level of the bony skeleton via X-Ray. Look at the red line, which is fixed and size-corrected between the 2 Before and After images (below), and where it bisects the fetlock joint (joint labeled 2) in the Before versus the After. As my photographs suggests, this XRay, and XRays like it , may tell a statistical tale of misalignment of the rigid or semi-rigid structures of the limb: subluxation of the fetlock joint by overtrimming the toe (which causes the heel to migrate anterior) and hijacking the coffin and pastern joints and thus destroying the elastic potential energy of the limb and body. If you are going to induce dysmorphism, you had better have level 1 evidence, or be pursuing this level of evidence, to justify that medical approach. Otherwise, you had better be wondering if there is a better approach. And you should darn well be willing to launch some comparative analyses between researchers that take different approaches, with as much quality as humanly possible instead of defensive bias, in the interest of the horse. I am a researcher by training. I am comfortable not being right. But I am not comfortable with a lack of an authentic try to learn more and improve my practices, especially with such dismal numbers for recovery, and nor should any other equine professional. This can't possibly relieve any "tension" in DDFT. In fact, this probably has no helpful effects at all. Give me a chance to build more data. Let's do more comparative work. Let's look more closely at these ideas. Me versus anyone else who is involved in conventional laminitis management. Let's build a Wellness Institute and Bring Equine Care into the 21rst Century as we have done for human medicine. Let's contemplate some elements of what would make a great Wellness Institute in future blog posts! Fixed orthotics, unfixed orthotics, no orthotics and common sense "best practices"
Please skim this article before reading this post :). The above article weighs in on some of the intellectual issues with human feet/body issues and various unfixed orthotics. I wish, for the horse's sake, that we were at the same intellectual and data point with them as we are for humans. We could be, if we really wanted to be. What a shame we are not. The wonderful content of this article simply addresses the current state of intellectual consideration and data on: bias in body construction or use and how unfixed orthotics may or may not help with that. We gave up on fixed orthotics for humans long ago. Why? Because fixed orthotics cause more harm than good, period. Fixed, unnatural structure placed at the bottom of the limb is a disaster. The goal of human prosthetics and orthotics: energy absorbing design, natural body use. The goal of current equine hoof care? Are you kidding me? A metal rim at the bottom of the limb? A fixed wedge guaranteed to create abnormal body use? In equines, currently, abnormal, unnatural hoof and body use is assumed to have medical benefit! Dysmorphism is assumed to have medical benefit! We gave up on these principals long ago with humans, because they do not work well, and we can, and have, done much, much better. Why do these ideas persist? First, because vets must meet their clientele where they are at. So it is up to us, owners and researchers, to help them meet a clientele who will refuse fixed orthotics for every situation their horse might encounter with use and medical crises. Second, more money is made off of lame, than sound, animals, in equine veterinary medicine and farrier work. Let's help vets and hoof care providers of all stripes find a way to keep making their money building wellness and not tinkering with suboptimal lifestyle and design choices. Let's introduce the human, and humane, field of UNFIXED orthotics to the equine. Within this spectrum for both species we are exploring the miracle of native design potential and the miracle of modern research/medicine! Let's live HERE! Mounted patrols use EasyCare Hoof Boots www.easycareinc.com.....see www.liberatedhorsemanship.com under "free articles" for a beautiful story from Bruce Nock on one of the first mounted patrols to go barefoot. We need, and it is time for, an equine wellness institute. Unfortunately for the equine, our current "best practices" in care and keeping are built on recent tradition, and not level 1 evidence. Let's give veterinary medicine, and you, the help we all need to give your horse a better quality of life through research on wellness! Level 1 Evidence: Read the description of Level 1 Evidence below. This is the type of research that is LIKELY RELIABLE folks. LIKELY! Why do we do this with human medicine, strive for this? Because we know that current, popular, recent opinion is not adequate medicine, that is why. We can, and will, do better with human medicine as a result of such studies. The question is, how do we bring more quality to equine research? Is it better to look at the research performed with humans to guide development of medicine for a species we don't use these standards with, or is it better to just keep building on the popular ideas of "care" we have developed over recent time? I would assert that we must develop a more comprehensive basis for comparative treatments in equines that is guided by the goal of maximizing life-long wellness. We are so far behind in some medical approaches with horses that we are still using principals that were removed from human medicine long ago. No other species suffers from the intellectual joke that a rim of metal at the bottom of their limb represents medical care under any circumstance. But because the equine industry started with that faulty premise, they seem to be stuck with it, to the extent that they keep suggesting more and more ways to goof around with this idea to "help" equines recover from health crises such as laminitis. But does it ever help relative to a control group ... ie those that don't have metal rims at the bottom of their legs? Only appropriate research, not biased research, will yield the quality of data needed to answer that question and advance our "best practices." Much of any recovery an equine is doing in response to an acute laminitic episode is probably despite our current standards of "care," not because of them. But who cares what I think? ?.....let's get to work and test this hypothesis! Give me a wellness institute so that we have a baseline to measure whether or not our popular notions offer any true aid to the domesticated equine. Based on the concepts advanced in human medicine in the last 100 years, we are so far off the mark with hoof and whole body care, that it is almost beyond belief. Level 1 (likely reliable) Evidence - representing research results addressing clinical outcomes and meeting an extensive set of quality criteria which minimizes bias. Proprioception: the unconscious perception of movement and spatial orientation arising from stimuli within the body itself....or, as I like to think of it: your nervous system used in concert with your native design. When I ruptured my ACL, I entered a wonderful physical therapy program via OSU. This is not a post about that, but rather about a simple comment made by Robin, one of the therapists. We were talking about repetitive load and wear and tear on joints. If your body has any bias, just like any degree of misalignment of your car, you will wear the equipment unevenly (tires versus cartilage). She mentioned after many years of road running, she and her husband had mitigated a lot of their current pain, and also based on the comprehensive evidence of the field, expected to alleviate much of their continued biased wear (= arthritis development) simply by running on trails in varied terrain......small stuff, BIG consequences. I would assert that adding barefoot running as part of their program would also yield huge benefits as it promotes "natural collection" and a varied and complete use of the body https://www.youtube.com/watch?v=7jrnj-7YKZE. First, the foot is generally used differently. You land on the ball of the foot, as opposed to heel, and create a smaller peak impact load better absorbed over a greater time interval (better use of your native bungee system, see post 2014/7/14/hoof-and-body-by-aidan). Second, you have this wonderful and fun piece of life you may never have enjoyed before, or at least not since you were a toddler, ie the interaction of your proprioception system with the earth and the weight of your body, which is an amazingly diverse and rich physical experience. From your body's perspective this physicality is like comparing "Row, Row, Row your Boat" 's complexity (running shoes) to that of a full orchestra playing a symphony (bare feet!). Rich and delicious and effortliss health benefits come from the implementation, or symphony of use, of your native design. Now, I have to chuckle, because people get hurt running in shoes (our equivalent to hoof boots) as well as barefoot. It is up to YOU to develop your common sense over the course of your lifetime. I still remember a news program that asserted that yoga caused a large number of serious injuries a year.....YOGA????? How out of touch with your own body are you if yoga poses a threat to yourself? Common sense......the art of self responsibility. So, in sum, simple or small decisions = big lifetime benefits or losses. We tend in this society to skip over that which would yield the best and most wonderful in our lives. Don't. Slow down. Smell the roses. Think and produce excellence and love and let your intellect, body and soul grow from that fertile soil. Horse mitigating impact loading by use of his native proprioception (bare hoof mediated body dynamics) and "natural collection." His native intelligence allows him more a "skating" or pushing phenotype to maximize energy absorption on hard surfaces as a consequence of being lower to the ground https://www.youtube.com/watch?v=7jrnj-7YKZE. People have been running barefoot for about 2 million years and equids with the modern hoof about 12 million years. Did you catch that? MILLIONs.....MILLIONs....... MILLIONs.....of years. Now, there were no podiatrists or ibuprofen or any sports medicine specialists during most of this time. Yet, we thrived. The very fact that we thrived, that any species thrives, should lead you to ponder: What amazing potential is inherent to native design? I am not sure why modern medicine in western culture is so committed to the cup being half empty as opposed to half full, ie that your body is "flawed and not enough" as opposed to "has riches available to you that we are only beginning to understand." It probably has 99% to do with economics, the basic economic consumerism and basic economic predation that is so much a part of our lives that we truly cannot distinguish between the phrase "health care" and the word "business." So, I wonder what amazing health benefits are possible if we contemplate adding a little barefoot to our lives???? To our horses lives?????? How do we unleash some of this native design potential we, and our horses, are born with? Habitat, use, diet, our bodies.....it's in there! Observe my presentations and go wild on the web! Combine that with a little common sense and wah lah! We, and our horses, are better! What is an Equine Blue Zone? From Wikipedia: Blue Zone is a concept used to identify a demographic and/or geographic area of the world where people live measurably longer lives. The concept grew out of demographic work done by Gianni Pes and Michel Poulain, who identified Sardinia's Nuoro province as the region with the highest concentration of male centenarians. As the two men zeroed in on the cluster of villages with the highest longevity, they drew concentric blue circles on the map and began referring to the area inside the circle as the Blue Zone. Dan Buettner identifies longevity hotspots in Okinawa (Japan); Sardinia (Italy); Nicoya (Costa Rica); Icaria (Greece);and among the Seventh-day Adventists in Loma Linda, California, and offers an explanation, based on empirical data and first hand observations, as to why these populations live healthier and longer lives. How can we add a little "wild" to your horse's life to increase his fitness, longevity, happiness and health? The principals operating above can also be established in your own little slice of heaven, whether it is a small single family property or a large scale boarding facility. Creativty, joy, understanding.......it is all possible. People all over the world are exploring the concept of an equine blue zone all on their own! A big shout out to Jamie Jackson for his major effort on this front. Start here: paddock paradise at AANHCP and then search with the phrase 'paddock paradise' on google and see what you get! Fun stuff! For helpful hints and design consultation for your own property, feel free to contact me! Imagine your effective body weight when bungee jumping. You reach the bottom of your first jump off a bridge and spring back in the air. Now imagine jumping off that bridge without the bungee cords.....ouch, or should I say, splat!.....your effective body weight upon landing is quite a bit more! Try standing up straight. Jump vertically. Now jut out your hip to the side and try to jump. Elastic potential energy allows you to convert the weight of your body in motion into the effective weight of springing. All of your ligaments, tendons and muscles store elastic energy and are designed, when you are moving, to absorb your body weight upon landing and then release your body weight back into the air, somewhat like your own internal trampoline or bungee cord system. When there is a kink in the system, say by jutting your hip to the side, your elastic system is misaligned and cannot function effectively.